'Roger's Red' Grape has great flavor! Mother Nature produces an array of interesting and unusual products. Chemists, engineers, chefs and others continue to be amazed and inspired by plants. Break-through inventions are created every year based on plant chemicals! Some plant products are nothing short of magical. Among these are the chemicals that give plants their colors. Plant colors are a great way to introduce children to the fascinating world of science; kids find the colors exciting and utterly captivating. Fortunately, several color ‘experiments’ can be done using plants and equipment common around the home. Cheap, simple and safe are always good, especially in working with children. And when there’s a bit of magic involved? Well, that’s the fun of science! Among the most interesting plant colors are the reds and blues. These are produced by a set of plant chemicals known as the anthocyanins (pronounced AN-tho-sigh-ANN-ins or an-tho-SIGH-uh-nins). These are the chemicals that make red cabbage red, grapes purple and the flowers of old-fashioned snowball bushes (Hydrangeas) turn blue or pink. Anthocyanins change color when exposed to mildly acidic conditions (vinegar; lemon juice) or alkaline conditions (baking soda). In fact, they can be used as pH indicators: they are pink in acidic solutions (pH < 7), purple in neutral solutions (pH ~ 7), greenish-yellow in alkaline solutions (pH > 7), and colorless in very alkaline solutions. Next time you buy a red cabbage, smash a bit of leaf and put a little vinegar or baking soda dissolved in water on the juice. See if your kids can guess whether the test solution is an acid or a base (alkali). 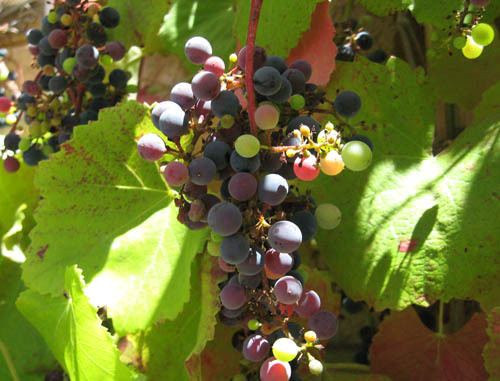 Wild and Concord purple grapes are a good source of anthocyanins. We shared our tips for picking and preserving wild (and other purple) grapes last month: http://mother-natures-backyard.blogspot.com/2016/08/california-gourmet-preserving-summer.html. If you made grape juice - and still have a little left – you may want to make some ‘Mother Nature’s Magic Grape Cupcakes’. They are delish – and nearly as easy as making a ‘box cake’. You may want to make these cupcakes in other flavors as well; this is based on a really nice, old-time recipe. But these cupcakes are truly magical. Have the kids help make them. Watch closely when you add the grape juice to the batter. What happens to the color? 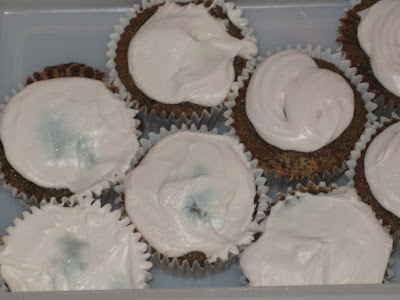 What color are the cupcakes after they are baked? Are you surprised? How do you explain what happened? Preheat oven to 350° F. Prepare cupcake tins (either grease & flour or use paper liners). This recipe makes 12 regular cupcakes; about 24-28 mini-cupcakes. Cream butter until light and fluffy (an electric mixer makes this job easy). Add sugar and continue beating 5 more minutes. Add eggs, one at a time. Mix well after each addition. Sift together the flour, soda, baking powder and dry milk powder. Add the dry ingredients and the juice, alternately, stirring to mix and ending with the dry ingredients. Watch for the magic as you add the juice. Add the extracts and stir just to mix. The batter will be a bit thicker than batter from a standard ‘box cake’. Spoon or pour batter into prepared cupcake tins, filling about 2/3 full. When you’re done, level the batter and remove bubbles by dropping the tins on a countertop several times (just hold tins about 4-5 inches above the counter, then drop the tins flat onto the countertop). Bake in a 350° F oven until done (toothpick inserted in center comes out clean); about 12-15 minutes for mini-cupcakes; 15-20 minutes for standard cupcakes. Let cool for 10 minutes; remove from tins and let cool completely. Check out the color! Frost with Magic Grape Frosting (below). Enjoy! ** for instructions on how to make homemade extracts and juice see: http://mother-natures-backyard.blogspot.com/2016/08/california-gourmet-preserving-summer.html The juice is unsweetened. It can be made from any wild or Concord type (purple) grape. You might be able to substitute a natural, unsweetened, commercial purple grape juice (will be tasty, but I can’t guarantee the magic). We are often pressed for time and just modify vanilla frosting out of the can. Pillsbury’s vanilla or any vanilla/vanilla buttercream frosting will work just fine. Add 2-3 Tbsp. wild grape extract (see above) to the frosting. Stir well. Then add enough powdered sugar to make the frosting stiff enough to spread. Frost the cupcakes with the pastel purple frosting. Enjoy! If you make a favorite vanilla frosting from scratch, that will work fine too. Just add the grape extract and extra powdered sugar to get the proper consistency. This year, we’re introducing a group of smaller butterflies: the Skippers (Family Hesperiidae), common butterflies of local gardens. One species sometimes seen in Western Los Angeles County is the White Checkered Skipper – Pyrgus albescens (pronounced PEER-gus al-BESS-sens). We’re spotting it more often this year, perhaps due to the drought. You may also have noticed this butterfly, in your garden or in the wilds, and wondered what it was. Like the Umber and Fiery Skippers discussed in July and August (2016), the Checkered Whites belong to the family Hesperiidae (the Skippers). 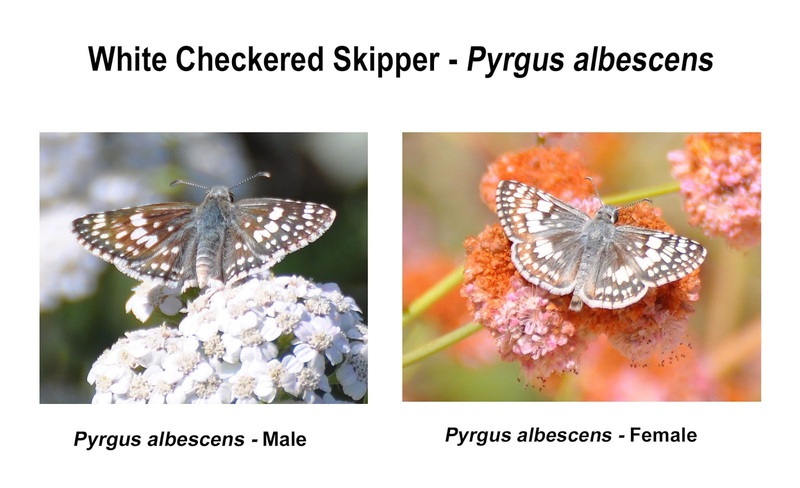 But Checkered Whites are placed in the subfamily Pyrginae - Skippers that perch with wings outspread, rather than half-open. 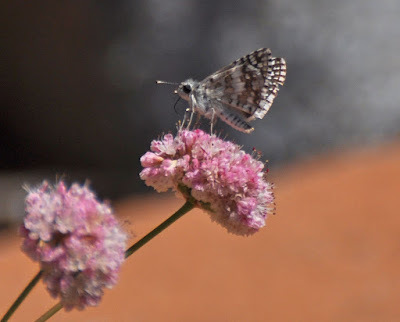 Pyrgus species are further classified to the tribe Pyrgini, which contains nearly 600 species in North and South America. 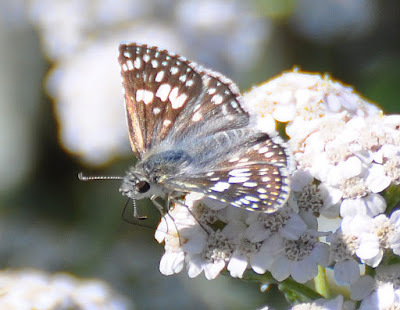 The genus Pyrgus, which contains about 50 species, can be found in Europe, temperate Asia, and North, Central and South America. All look somewhat similar: small gray butterflies, with square white blotches, and black-and-white checkered wing fringes. Pyrgus species can be difficult to tell apart, particularly in areas where the ranges of several species overlap. 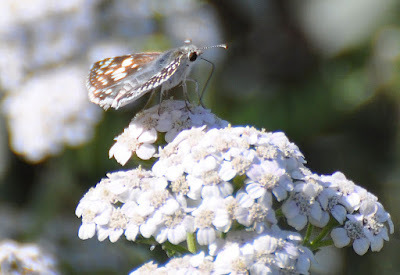 The White Checkered Skipper is sometimes included in the more common and widespread Pyrgus communis (the Common Checkered Skipper). In fact, there is still lively debate regarding the taxonomy of this ‘species’. [2, 3] We’ve chosen to treat it as a separate species, due to its range limits and minor physical (morphological) differences. However, it’s still not clear whether it is better regarded as a sub-species or variant of Pyrgus communis, an incipient species, or a truly separate species. To learn more, we recommend references 2 & 3, below. 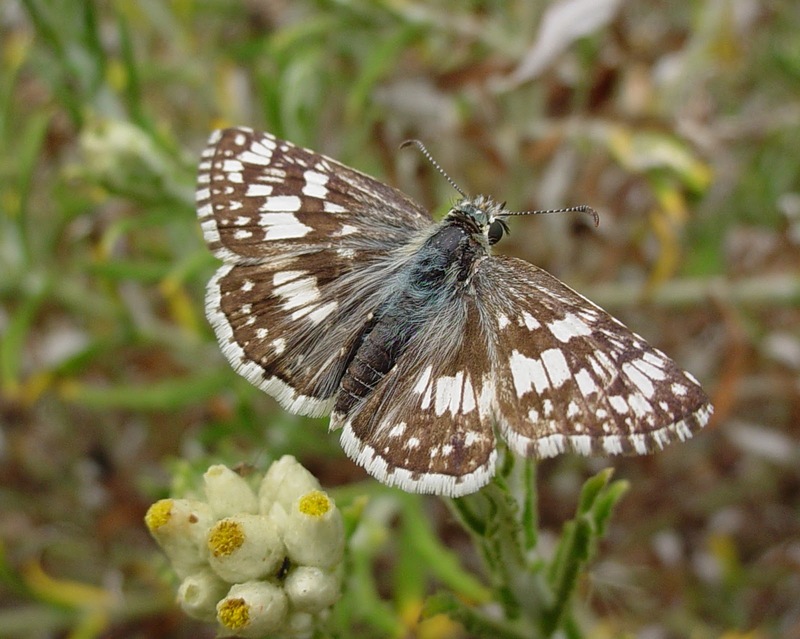 White Checkered Skippers are small butterflies, with a wingspan of 1 - 1 1/2 inches (2.5 - 3.8 cm). Their coloration is similar to, but slightly paler than, the Common Checkered Skipper. The thorax (mid-body) of the males appears blue, due to conspicuous blue hairs. The female body, lacking the blue hairs, appears dark gray to black. The abdomen (hind-segment) is dark gray with white stripes. Both sexes have large, square white spots on the upperside of both sets of wings, forming irregular, blotchy stripes. The wing background color is gray or gray-brown mixed with red-brown, the brown being more obvious near the wing margins. The wing-fringes are checkered black and white. This is particularly obvious in the males, where the checkered squares reach to the edge of the wing fringes. The underside of the wings is overall a light gray, giving individuals a pale gray or gray-blue appearance in flight. On closer inspection, the underside has a series of irregular bands, composed of squares that are pale gray, tan and dark brown-black. You rarely see the underside, but it’s quite pretty. As always, photographs are a great help in identifying butterflies and appreciating their intricate beauty. 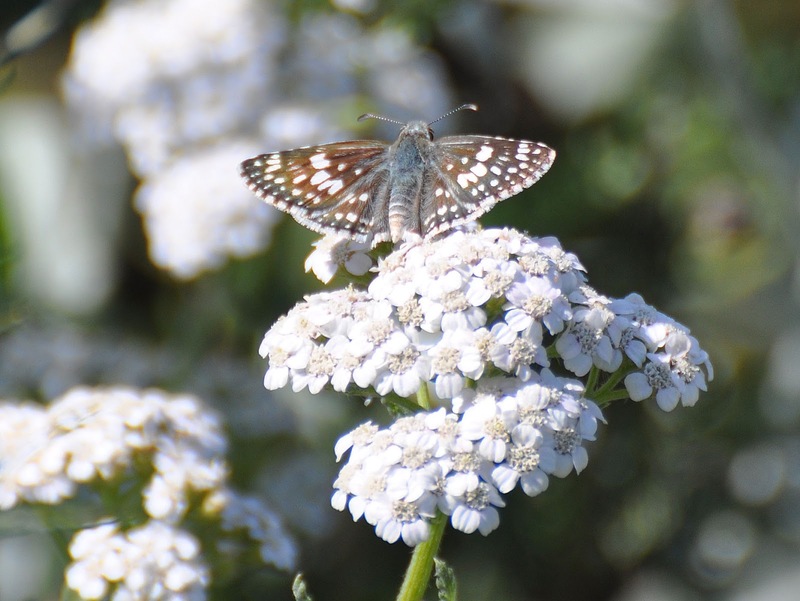 In our gardens, we see White Checkered Skippers flying near host plants or feeding on a number of nectar plants. The peak flight period is from about February until October. Like most skippers, Pyrgus albescens favors plants with many small flowers. We see them most commonly on plants in the Sunflower (Asteraceae) and Mint (Lamiaceae) families, as well as the local native Buckwheats. 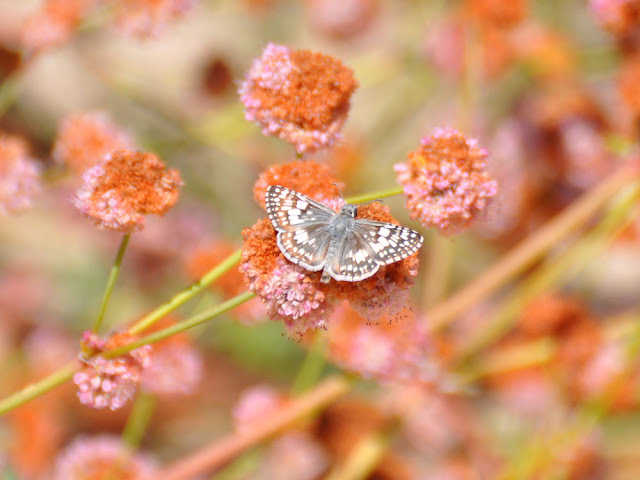 These butterflies are easy to identify when nectaring. 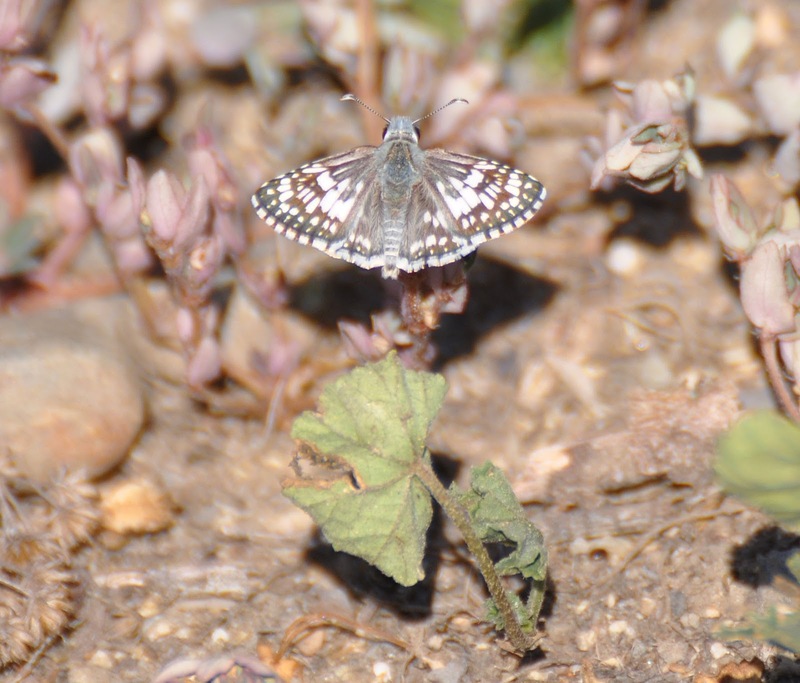 We also see Pyrgus albescens perched on leaves and sometimes on the ground. Males perch and cruise in places with nectar and host plants, looking for food and receptive females. Males have scent scales on the upperside of the forewing that release pheromones that attract females. The males are quite territorial; we see them vigorously chase White Checkered and other Skippers, particularly the Fiery Skipper. White Checkered Skippers likely have several broods a year in our area. The eggs are pale green and are laid singly on leaves of host plants. The larvae (caterpillars) are pale blue-green with stripes. They construct simple ‘tents’ by folding over a leaf and fastening it with strands of silk. While the scope is not well-defined, several genera of plants in the Mallow Family (Malvaceae) are known to serve as larval host plants. These include the true Mallows (Sida or Malvella species), the Globemallows (Sphaeralcea), Velvet-leaf or Indian Mallows (Abutilon), Poppy mallows (Callirhoe) and likely others. In our area, the common native host is most likely Alkali Mallow (Malvella leprosa). We have seen individuals visiting the non-native Cheeseweed (Malva parviflora); we’ll try to see if this species also serves as a host plant. 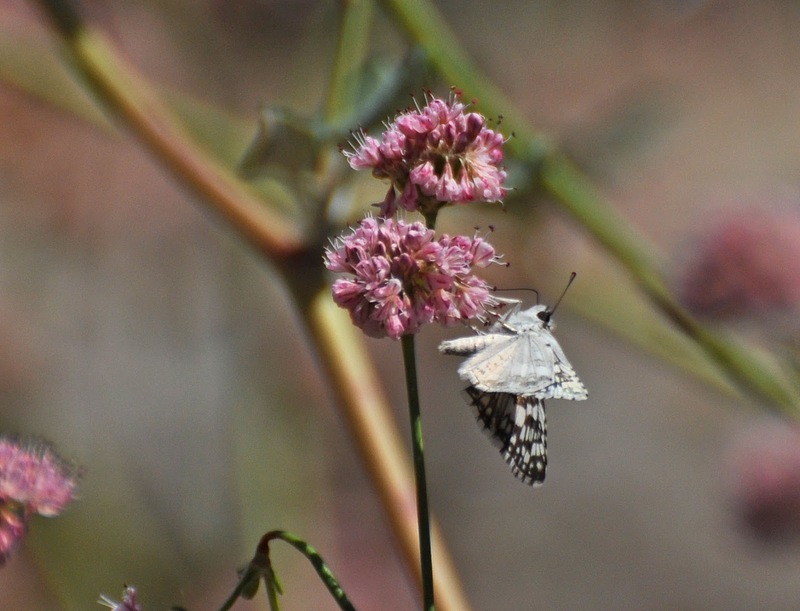 We are always glad to see this pretty butterfly in our gardens. Look for them in your own garden, particularly if you grow the host plants. We think you’ll enjoy watching these and other Skippers. Their behavior is more interesting than you might think! Plants know no political borders. 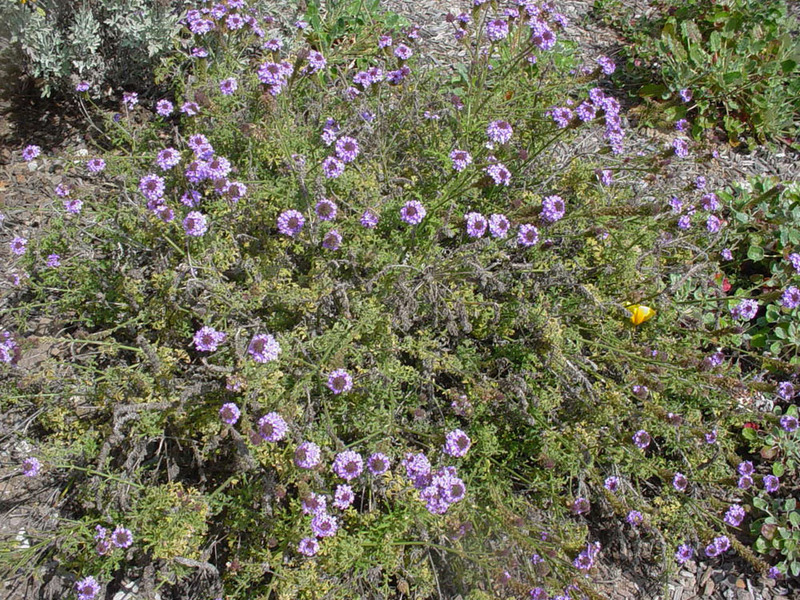 In fact, the ‘California Floristic Province’ (the area west of the Sierra Nevada Range in California) includes parts of Baja California, Mexico. We’ve spoken before about the interesting connections between our Channel islands and those off Baja California (http://mother-natures-backyard.blogspot.com/2014/07/plant-of-month-july-guadalupe-island.html). Because plants of the Baja Peninsula share not only climate, but also a geologic and botanic history, many Southern California native plant nurseries sell Northern Baja plants. These species often grow well in western Los Angeles County and add accents not available in locally native species. One such plant is the Lilac or Cedros Island verbena. Lilac verbena hails from Cedros Island, off the coast of Baja. The island, which is well known to sport fishermen, is located about 62 miles (100 kilometers) west of Ensenada, Mexico, in the Pacific Ocean. Cedros Island, or Isla de Cedros ("island of cedars"), is home to a number of unique plant and animal species, some of which are endemic (like Verbena lilacena). To learn more about Cedros Island see references 1-3, below. 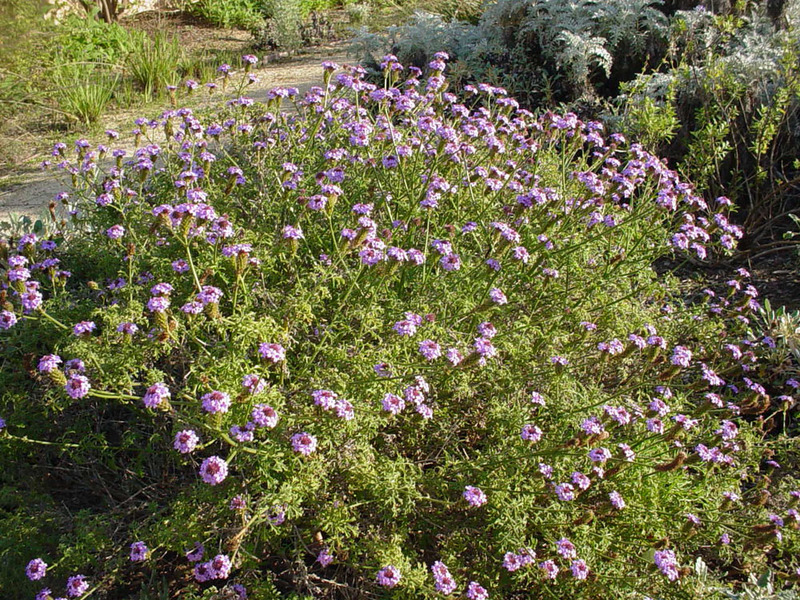 Lilac verbena naturally grows in sandy washes, canyons, slopes, cliffs and hillsides. It’s a mounded, evergreen sub-shrub that’s 2-3 ft. (about ½ to one meter) tall and 3-4 feet wide at maturity. In most gardens (with occasional water) the plant is evergreen; in a very dry garden, some leaves may be lost in the dry season (summer/fall). 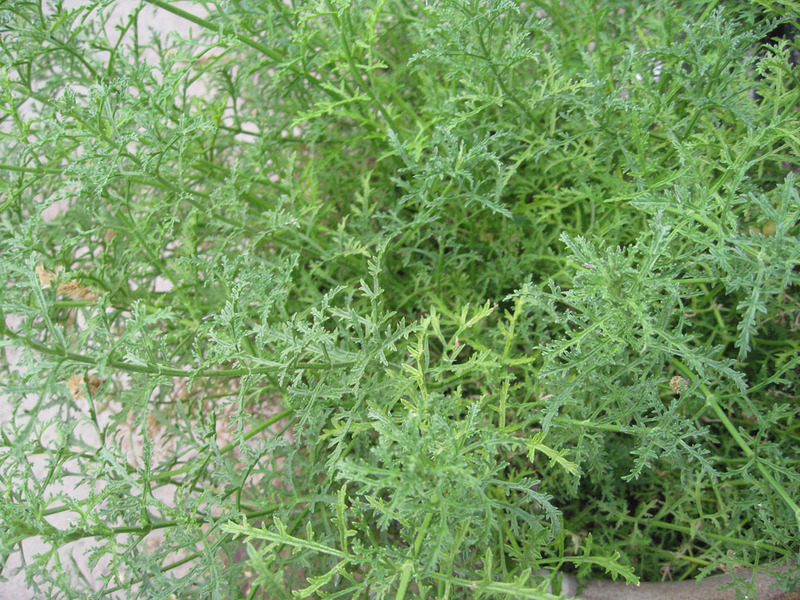 The plant appears delicate, with numerous thin stems which are surprisingly stiff. The branch tips are herbaceous; the lower parts of branches become woody with age. Plants grown in part-shade are more rangy; those grown in full sun are naturally more compact (see above). Foliage plays an important role in California native gardens. 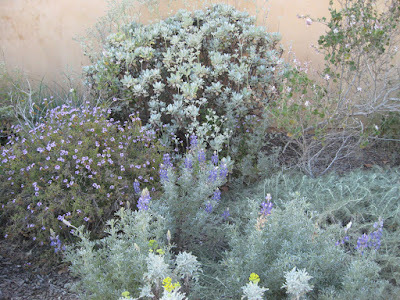 Foliage colors, shapes and scents provide the contrasts that define mediterranean climate gardens. 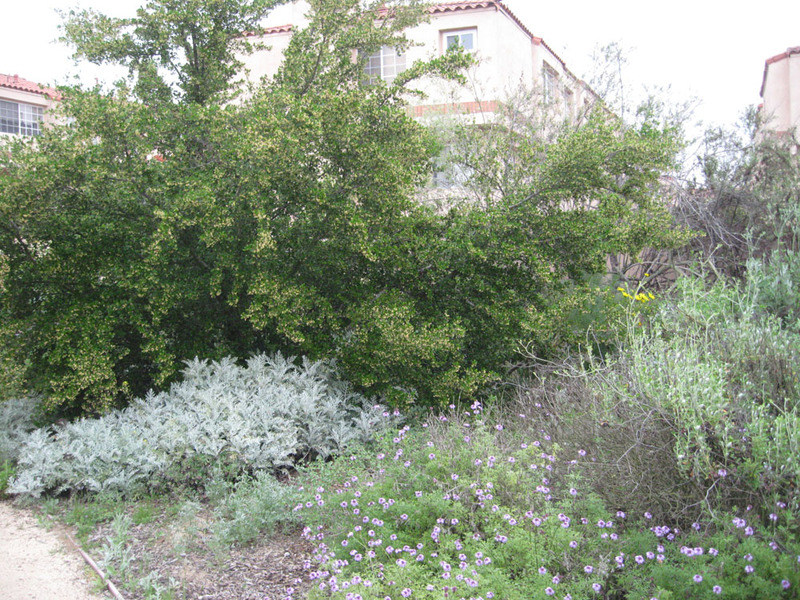 Veteran Southern California gardeners know the trick of pairing lush, green plants with the soft gray- and blue-green foliage common in the Coastal Sage Scrub plants. The contrast is nothing short of magical! The problem is finding smaller shrubs that are both drought tolerant and vivid green. Lilac verbena is one such plant. In fact, foliage is one of Verbena lilacena’s strong points. The color ranges from medium green to almost blue-green, depending on site characteristics. 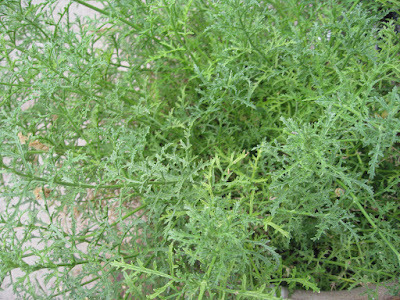 The leaves are highly incised, giving a lacy appearance to the foliage. In fact, Lilac verbena looks like a traditional garden plant; that’s probably one reason it’s become so popular with water-wise gardeners. As if the foliage isn’t enough, Verbena lilacena has pretty flowers and a growing season that spans much of the year in our area. In hot, inland areas, plants seems to flower less in the hottest months. But plants can be covered in blooms from spring well into fall. The secret to a long blooming season is simple: deadhead (remove) the spent flowering stalks. 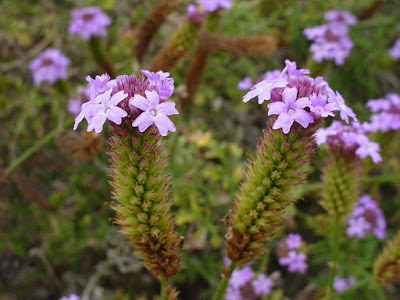 Lilac (Cedros Island) Verbena (Verbena lilacena). The flowers themselves are small – perhaps 1/3 of an inch (less than 1 cm) across. They have five notched petals and are relatively simple. The flowers grow along flowering stalks densely packed with flowers (see above). The flowers open serially, from bottom to top, providing a long bloom season. In the most common cultivar, Verbena lilacena ‘De La Mina’, the flowers are medium purple (the straight species has paler purple flowers). 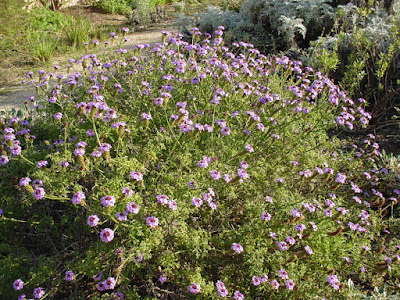 In the cultivar ‘Paseo Rancho’, the flowers are pastel pink. All are strikingly pretty and attract a wide range of pollinators, from butterflies to pollinator flies. The flowers have a very sweet aroma; particularly noticeable on days with higher humidity. 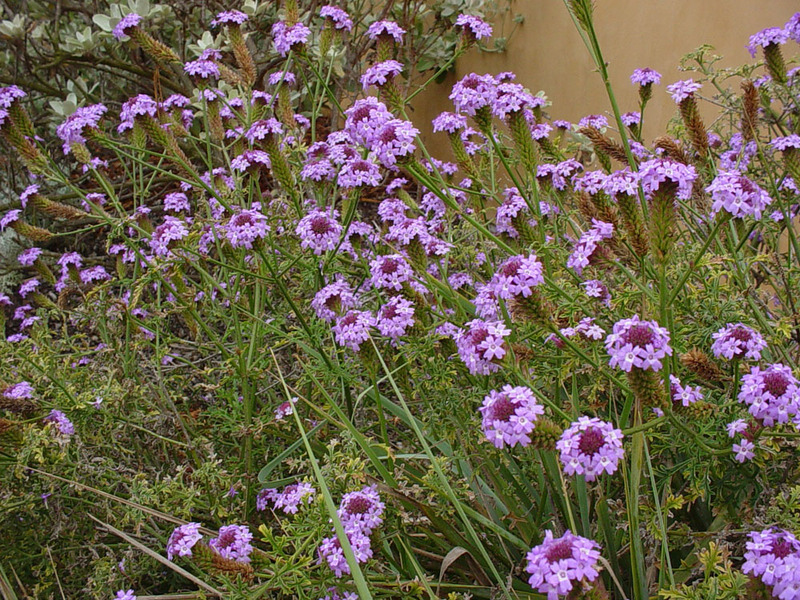 The cultivar Verbena lilacena ‘De La Mina’, which is readily available at native plant and other nurseries offering water-wise plants, was collected by Carol Bornstein on Cedros Island. 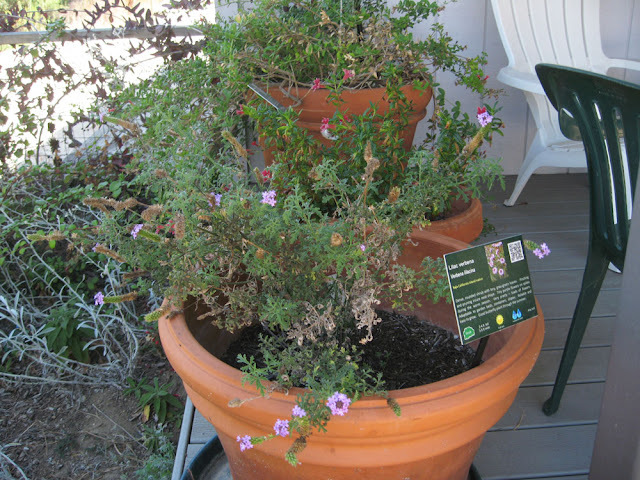 It was introduced into the horticultural trade by the Santa Barbara Botanic Garden . 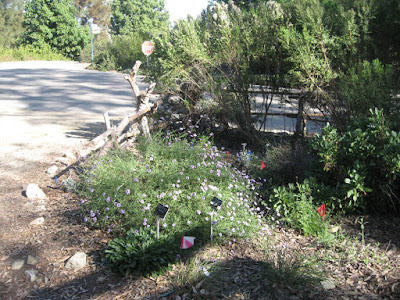 ‘Paseo Rancho’, which is less readily available currently, is slightly larger and was introduced by Rancho Santa Ana Botanic Garden . Lilac verbena does well in many local gardens. It prefers a well-drained, sandy soil, but can be grown in clays. If your soil has questionable drainage, try planting it on a slope or on a small berm. While often grown in full sun, Verbena lilacena may do better with some afternoon shade in hot, inland gardens. But this is not a plant for shady places – it really does need some sun to bloom well. Lilac verbena is quite tolerant of a wide range of garden water regimes. It prefers a monthly deep watering in summer; that’s similar to conditions in the wild. But it can take even more frequent summer water, provided soils are well-drained. Be careful not to over-do with overhead watering during warm weather, as powdery mildew can be a problem. Watch for snails and slugs, which can eat young foliage. Lilac verbena does require a little pruning to look good. Deadhead the flowering stalks regularly for best bloom. And cut back branches by 1/3 each fall to create a full, mounded shape. Wait until the weather cools down before pruning. The pruning doesn’t hurt the plant. In fact, it simulates ‘natural pruning’ by animals. 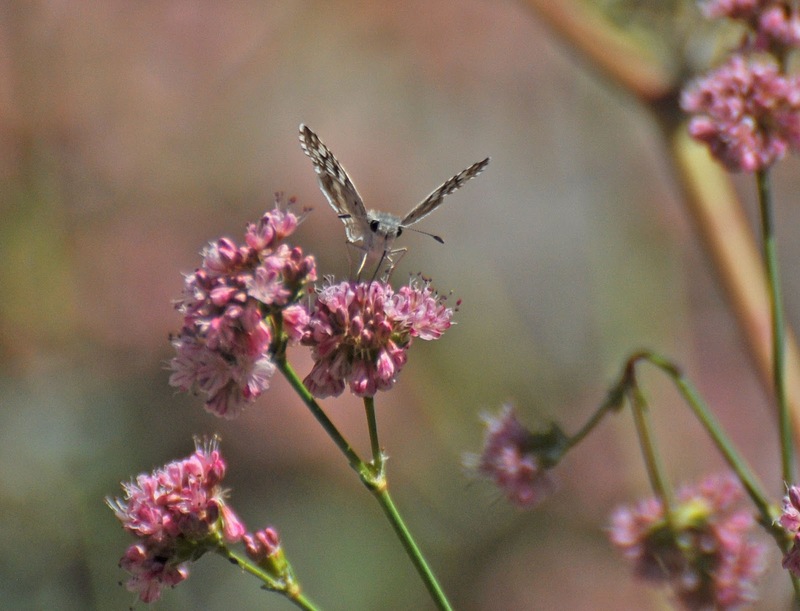 Lilac verbena can be a welcome addition to many local gardens. It’s water-wise and of a size that can be accommodated by even a small garden. 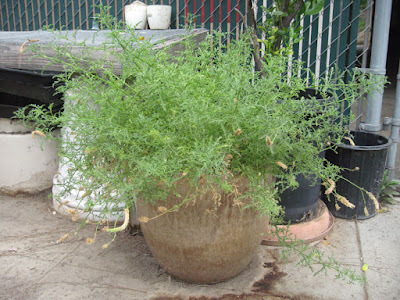 If needed, it can even do well in a container or large hanging basket. The green foliage creates a green oasis in the summer-fall garden. It is a great plant for providing contrasts. This is one of our favorites for floral scent. Plant it where you can enjoy the sweetness as you walk past. 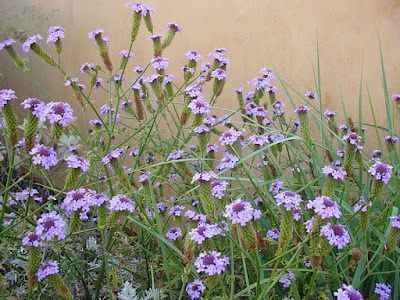 While not a super-star like the Buckwheats, Verbena lilacena attracts enough insects to warrant a place in the habitat garden. And if you love those rare, unusual native plants, this is one of those. 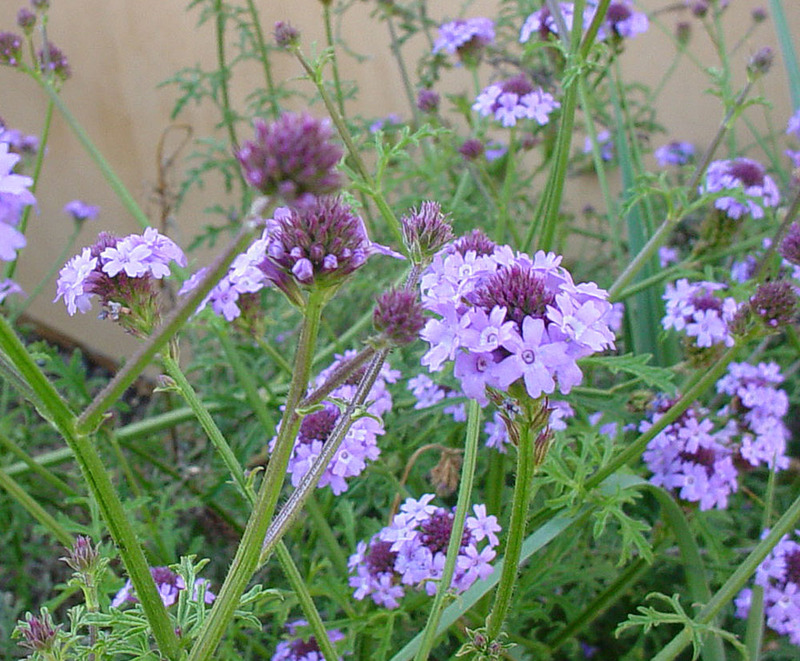 In short, Verbena lilacena is an attractive, useful plant. It does well in local gardens with very little care and it is water-wise (ever so important these days). So consider purchasing a Lilac verbena at the up-coming native plant sales.